You can never go wrong in picking up a novel by this author. 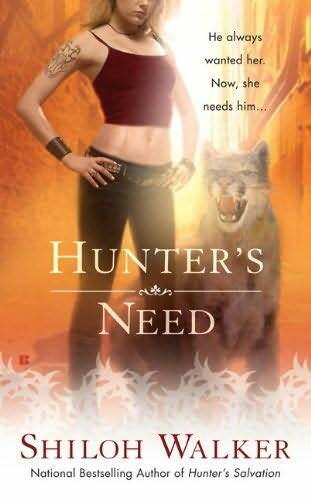 Though I have not read the whole Hunters series and am not that much of a fan of romance of paranormal genre, any book by Shiloh Walker is well worth the try. This book is trademark Shiloh Walker, mystery and suspense in spades together with a hero and heroine that you can relate to, whose love and need for one another is just out of this world. Duke is a shape-shifter who was betrayed by Ana 5 years back when Ana and Duke had first met. Duke is a hunter, a part of an elite group who all have special powers. Some of them are vampires, others werewolves with a couple of witches thrown into the mix with shape-shifters as well. Ana is a psychic who had to use her ability to save her younger brother from the clutches of a sadistic vampire by luring Duke in. Duke had never forgiven or forgotten the fact that Ana had almost cost him his life. Going out of his way to avoid Ana is the hardest thing Duke has ever had to do since he still wants her like crazy. Ana can’t help but want Duke as well. But knowing that Duke despises the very ground she walks on finally takes its toll on Ana and she leaves the Hunter’s school and moves to Alaska to settle down. A year on, Ana has a job and a place to call home, together with a nagging feeling that there is something horribly wrong or evil lurking around the mountains that surround the city. This feeling intensifies when Ana finds out that girls have been going missing, some of them turning up dead, others never to be found. And all the girls bare a strong resemblance to the first girl Marie that went missing, whose murder was at first blamed on her fiance’ Paul, who now lurks on the streets mumbling and muttering to himself. Ana knowing that she wouldn’t be able to handle whatever evil that lurked around, calls in the Hunters for help. Duke who had been growing ever so restless since Ana left, is the one to pick up the call and eventually the one to head to Alaska to figure out whats got Ana so riled up. From the moment these two see each other, its all sparks and high powered jolts of lust between the two. As these two team up to find out the source of evil who has killed dozens of young girls, the ghosts of these young women tend to haunt the two and eventually end up helping Ana to identify the killer who turns out to be much too close to comfort to the first victim. All in all, great romance, a pine tingling mystery and a yummy shape-shifter with whom a gal can never go wrong! ← Previous Post Kindle on your PC!